As part of Neat’s growing partner channel for accountants and bookkeepers, the company has released a unique feature on its website. The new “Find an Accountant” resource helps to connect Neat’s 100,000+ small businesses with certified Neat accountants and bookeepers in case the Neat clients need extra help in monthly or annual bookeeping tasks or tax prep. In addition to automatically tracking receipts, invoices and other business expenses, Neat now facilitates the tracking of business miles. Be sure to never miss a mile of this important and valuable business deduction with Neat Software. Learn More. 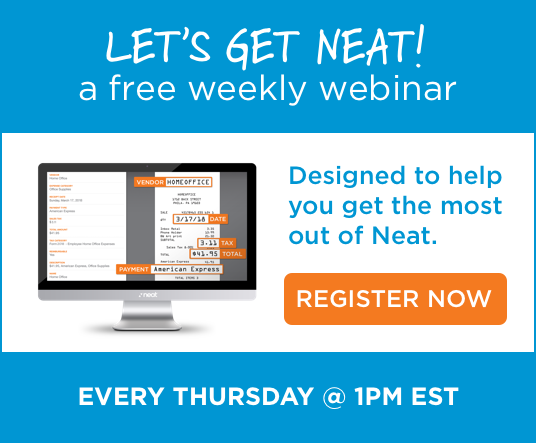 Neat is building an extensive marketplace of solutions for small businesses to research and find software, services and hardware that helps them grow their businesses. Be sure to check it out by clicking here. Check back often because new resources will continue to be added. The Small Biz Rising Blog was created by The Neat Company. It is a collaboration between a group of leading vendors who support small business growth through software and services. Topics range from marketing to finance to work-life balance. Every small business owner is bound to find something of interest and helpful to their growth. Click here to read it. You may have heard that Neat doesn’t make scanners anymore. That’s true, but that doesn’t mean we don’t still love scanners. In fact, we love them so much, we bundled our popular software with the world’s leading scanner maker, Fujitsu, and their popular ScanSnap line. Learn about the bundle here. Are you an accounting or bookkeeping firm looking to use and resell or refer a great solution and brand to your clients that will help streamline the flow of expenses, eliminate paper and facilitate collaboration? Learn more about the program here.